Terry and Darlene Geiser; Geiser Equine, Inc. Are Nationally Accredited Mounted Police Trainers and conduct Mounted Police Schools Nationwide, which are college accredited through the University of Louisville's Southern Police Institute of Kentucky. Their training staff is Internationally recognized as leaders in the field of Mounted Police training. Terry and Darlene have developed SAFE training programs for the horse owner, by combining their decades of police and horse experience. Both retired from the Jacksonville, Florida Sheriff's/Police Department in 1996 - Terry as Chief Pilot Instructor of the Aviation Unit and Darlene as Sergeant over the Mounted and K-9 Units. They raised, trained and showed horses of all breeds; Thoroughbreds, Quarterhorses to Clydesdales. Terry's expertise is in the driving and ground training as Darlene's is in the equitation of Western, English and Jumping. Darlene spent a lifetime showing with many Championships. She rode to Gold, Silver and Bronze Medals in Mounted Police Ollympic Competitions with her famous police Palomino Quarterhorse, "Bold"; raised and trained by Terry and Darlene (with the help of fours sons). Bold became a Breyer Model in 1997 as the Breyer Special Horse of the Year, for his many police horse deeds, television commercials and stage plays. The Geisers continued their National horse expo presentations at several Equitana USA's, the Southern National Horse Expo's, Equus Amercia both Houston and Kansas City, the Carolina Classic, and many State Horse expos and horse celebrations Their one of a kind "Trail Rider Safety and Self-Defense Clinics" are held Nationwide. These clinics deal with all a rider must do to be safe on the trails as well as in the show ring, through desensitizing the horse, which is building the assertive horse with a no fear attitude, to using their own horse for protection on the trail from an assailant. Safety is the main concern and goal of these clinics, as most horse owners today trail ride their horse at some point, even show horse owners. Specialized classes are offered in GPS (fining your location and a way out to safety) and emergency situations; first aid for both horse and rider and trailer safety with necessary equipment to carry. The legal issues of rider verses vehicle while riding by the road or on the trail is a hot topic, this topic is covered. 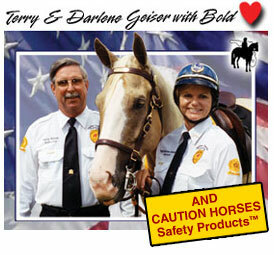 As retired police officers, horse owners and instructors, Terry and Darlene Geiser bring forth to the horse owner something very unique and most importantly SAFE for every person who attends their training sessions. This is a modern world of liabilities in everything we do. Our clinics educate for Safety and Awareness, as the goal is to totally enjoy your horse and be SAFE. Published in the book, "The Making of the Perfect Horse" by John Lyons; The Chapter on Traffic Training. Currently preparing the book, "Trail Rider Safety and Self-Defense"